Erick O'Brien Green (born May 9, 1991) is an American professional basketball player for Olympiacos Piraeus of the Greek Basket League and the EuroLeague. He finished the 2012–13 NCAA Division I season as the top scorer in the nation at 25.0 points per game while scoring a total of 801 points. Green was selected by the Utah Jazz with the 46th overall pick in the 2013 NBA draft, but was later traded to the Denver Nuggets. Green was born in Inglewood, California but grew up in Winchester, Virginia. He spent the first three years of his prep career at his hometown's Millbrook High School, before transferring for his senior year to Fairfax's Paul VI Catholic High School. Between the two schools, Green earned four varsity letters. In his lone year at Paul VI, he led the Panthers to a state championship (coincidentally, Green had led Millbrook to a state championship the previous season) and was named the 2009 Division I Independent League Player of the Year. After Paul VI's championship he was named an EA Sports All-American. The Washington Post also selected him to their All-Metro Team, the Associated Press picked him as their Virginia Group AA Player of the Year, and Green was named the district and region player of the year. Green struggled his freshman season in 2009–10 and averaged just 2.6 points per game and shot 29.3% from the field. His lack of production, he later admitted, "turned [him] into a gym rat" and motivated him to work harder than everyone else to improve his game. Each progressive season he increased his scoring, rebounding and assist averages. By his senior season in 2012–13, and while leading NCAA Division I in scoring for most of the year, the media was discussing Green as a dark horse candidate for Atlantic Coast Conference Player of the Year. Despite his production, the Hokies finished the year with a 13–19 overall record, including a 4–14 conference record where they finished in last place. On March 12, 2013, Green was named the ACC Player of the Year by the ACC's media selectors (Miami's Shane Larkin was the coaches' pick). He joined Maryland's Len Bias (1985–86) as the only two players of the year who competed for teams with losing ACC records. On June 27, 2013, Green was selected by the Utah Jazz with the 46th overall pick in the 2013 NBA draft; his rights were immediately traded to the Denver Nuggets. He joined the Nuggets for the 2013 NBA Summer League where he averaged 9.3 points, 2.2 rebounds and 1.8 assists in six games. On August 26, 2013, Green signed a one-year deal with Montepaschi Siena of the LBA. In 45 Italian league games for Siena, in 2013–14, he averaged 10.8 points, 1.5 rebounds, and 1.1 assists per game. He also averaged 11.1 points, 1.7 rebounds, and 1.0 assists per game, in 10 games played in the EuroLeague that same season. In July 2014, Green re-joined the Denver Nuggets for the 2014 NBA Summer League. On August 1, 2014, he signed a three-year, $2.3 million contract with the Nuggets after averaging an impressive 16.6 points per game over five Summer League contests for the team. On January 20, 2015, he was assigned to the Fort Wayne Mad Ants of the NBA Development League. Five days later, he was recalled by the Nuggets. In the Nuggets' season finale on April 15, he had a season-best game with 17 points, 7 assists, 4 rebounds and 1 steal in a loss to the Golden State Warriors. In July 2015, Green re-joined the Nuggets for the 2015 NBA Summer League where he averaged 14.8 points, 1.4 rebounds, 4.0 assists and 1.8 steals in five games. On November 5, 2015, he was waived by the Nuggets. On November 21, 2015, Green was acquired by the Reno Bighorns of the NBA Development League. He made his debut for the Bighorns later that night, scoring 23 points in 35 minutes off the bench against the Los Angeles D-Fenders. On January 29, 2016, he was named in the West All-Star team for the 2016 NBA D-League All-Star Game. On January 26, 2016, Green signed a 10-day contract with the Utah Jazz. The next day, he made his debut for the Jazz in a 102–73 win over the Charlotte Hornets, recording four points and one assist in four minutes of action. On February 5, he signed a second 10-day contract with the Jazz. On February 15, the Jazz did not renew his contract, making him a free agent. Four days later, he re-joined the Bighorns. At the season's end, he was named to the All-NBA D-League First Team. On July 15, 2016, Green signed a two-year deal with Olympiacos Piraeus. 1 2 3 4 5 6 "11 Erick Green". HokieSports.com. Retrieved February 27, 2013. 1 2 "Erick Green Stats". Sports-Reference.com. Sports Reference LLC. Retrieved March 1, 2013. 1 2 3 Giannotto, Mark (February 20, 2013). "For Virginia Tech's Erick Green, success at the rim started in the gym". WashingtonPost.com. Retrieved March 1, 2013. ↑ Teel, David (February 5, 2013). 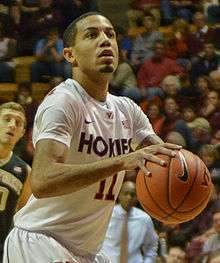 "Teel Time: Is nation's top scorer, Virginia Tech's Erick Green, the ACC's player of year?". DailyPress.com. Retrieved March 1, 2013. ↑ Wood, Norm (March 12, 2013). "Virginia Tech's Erick Green earns ACC's player of the year honors". DailyPress.com. Retrieved March 12, 2013. ↑ Giannotto, Mark (March 12, 2013). "Virginia Tech's Erick Green named ACC player of the year". WashingtonPost.com. Retrieved March 16, 2013. ↑ "Denver Nuggets announce 2013 Summer League roster". NBA.com. July 8, 2013. Retrieved August 26, 2013. ↑ "MONTEPASCHI SIENA nabs rookie scorer Green". Euroleague.net. August 26, 2013. Archived from the original on August 31, 2013. Retrieved August 26, 2013. ↑ "Mens Sana Siena announced Rochestie, Green, Hunter and English". Sportando.com. August 26, 2013. Retrieved August 26, 2013. ↑ Erick Green TOTALI STAGIONE (Italian). ↑ "Nuggets prospect Erick Green benefits from overseas experience". NBA.com. July 9, 2014. Retrieved July 23, 2014. ↑ "2014 Summer League Player Profile – Erick Green". NBA.com. Retrieved July 23, 2014. ↑ "Denver Nuggets Sign Erick Green". NBA.com. August 1, 2014. Retrieved August 1, 2014. ↑ "Nuggets Assign Erick Green to Fort Wayne Mad Ants". NBA.com. January 20, 2015. Retrieved January 20, 2015. ↑ "Nuggets Recall Green from Fort Wayne". NBA.com. January 25, 2015. Retrieved January 25, 2015. ↑ "Erick Green 2014-15 Game Log". Basketball-Reference.com. Retrieved November 5, 2015. ↑ "Former Virginia Tech star Erick Green excited for Year 2 in NBA". Roanoke.com. August 8, 2015. Retrieved August 8, 2015. ↑ "Nuggets Sign Kostas Papanikolaou". NBA.com. November 5, 2015. Retrieved November 5, 2015. ↑ "BIGHORNS ACQUIRE FORMER NBA PLAYER ERICK GREEN". NBA.com. November 21, 2015. Retrieved November 21, 2015. ↑ "D-Fenders Hold Off Bighorns At Home". NBA.com. November 21, 2015. Retrieved November 21, 2015. ↑ "Sixteen NBA Veterans Headline Rosters for NBA Development League All-Star Game Presented By Kumho Tire". NBA.com. January 29, 2016. Retrieved January 29, 2016. ↑ "Jazz Sign Erick Green to 10-Day Contract". NBA.com. January 26, 2016. Retrieved January 26, 2016. ↑ "Hood scores 24 as Jazz defeat Hornets 102-73". NBA.com. January 27, 2016. Retrieved January 28, 2016. ↑ "Jazz Sign Erick Green to a Second 10-Day Contract". NBA.com. February 5, 2016. Retrieved February 5, 2016. ↑ "Green Rejoins the Bighorns". OurSportsCentral.com. February 19, 2016. Retrieved February 20, 2016. ↑ "NBA Development League Announces 2015-16 All-NBA D-League Teams". NBA.com. April 29, 2016. Retrieved April 30, 2016. ↑ "Erick Green signs with Olympiacos". Sportando.com. July 15, 2016. Retrieved July 15, 2016. Wikimedia Commons has media related to Erick Green.